Troubled by Chronic Knee Pain? Download a free Knee Pain Treatment Guide and get options for improved comfort. The possible treatments for knee pain range from physical therapy to surgical options like partial and total knee replacement. Our specialists and surgeons have years of experience in diagnosing and analyzing knee pain and finding the right treatment option for our patients and their lifestyles. 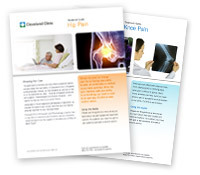 To help you decide the best approach to take for treating knee pain, Cleveland Clinic Florida Department of Orthopaedic Surgery has produced a free downloadable knee pain guide. Symptoms and causes for knee conditions such as osteoarthritis, knee fractures, bursitis, injuries and more. 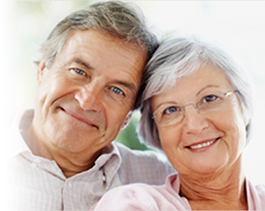 Conservative treatment approaches such as physical therapy, pain relievers and injections. Surgical options include partial and total knee replacement, as well as the innovative All Inside ACL Reconstruction. Treatment options for patients who can't travel to Cleveland Clinic including MyConsult, our online medical second opinion service. Don't let hip pain keep you from enjoying a normal life. Get answers today by downloading our free guide. To schedule a consultation with one of our orthopaedic specialists, please call us at: 844.674.7629. Cleveland Clinic Florida was one of the first hospitals in the region to perform "All Inside ACL Reconstruction," a minimally invasive procedure typically leading to shorter recovery times and less pain than traditional ACL reconstruction techniques.